Jossan (S*Me-Na-Yak Call Me Josephine Brown) is dating again! Her date is – Goofy, IC S*Edo Créma de Luxe, the dad of the A-litter! Although Albert and Goofy have different looks, there are similarities; Albert is white like his dad and moves and has a body language that is pretty much the same! That was quite amazing to see, I did not remember from before how Goofy moved and cuddled. He was mostly stunned and excited when we introduced him to Jossan last year, so he did not interact with us a lot. Here is a picture of Goofy and his brother Musse we took when we left Jossan in Sala, about 1 hour 15 minutes drive from Stockholm, two days ago. It was a bit funny; the first time we were there, about a year ago, Jossan seemed to be scared, and hid immediately. But now – she jumped on the kitchen table, behaved as if Sofie’s apartment was her summer house or something. She apparently recognized where she was and she was not displeased. After a few minutes we let Goofy in and he started singing and flirting with Jossan. Then we gave them some privacy and left. We got a message from Goofy’s owner yesterday, she witnessed one mating and heard another! We miss Jossan, but we do not miss her yelling and calling for a guy. She (as the most of cats) calls a lot when in heat. Also, Albert had to be separated from her, and it was not fun for anyone, but he has such a nice temper and we have a big house, and enough cats so that everyone has a company. Albert is still small, but he changes from Dr Jekyll to Mr Hyde when he feels that Jossan is going in heat. Then he is all stud, 110%, calling and following Jossan. But when his mom is not in heat, or when she is away, he is a little baby, playing with his toys and cuddling with us all the time. We hope that this time we are as lucky as last year, that Jossan has a problem-free pregnancy and nursing period, and above all – that she remains healthy and gets healthy babies. If all goes well, the delivery will be around the 4th of May. Jossan’s dates with the dark handsome guy, Flippen, did not work out. Jossan did not get pregnant in spite of three dates they had and her being very much in heat. She simply never accepted him as a mating partner. We liked Flippen, very much so, but Jossan did not. Two months ago we did the FIV/FeLV tests again and started looking for a new date. It was not easy. I secretly suspected Jossan to be a racist, as shameful as it may sound. I talked to the veterinary about it, and apparently, that is not a phenomenon unheard of – it happens with some dogs and cats that they dislike the partner we choose for them if they are extremely different in color. That puzzles me; one would think that nature encourages diversity and that mixing of different genes is good for species (and quite a difference in color can be a good indicator for variations of genes), but no, something is apparently not quite right with that reasoning. Whatever the reason is, Jossan seemed to dislike Flippen and I suspected it was because of his color. 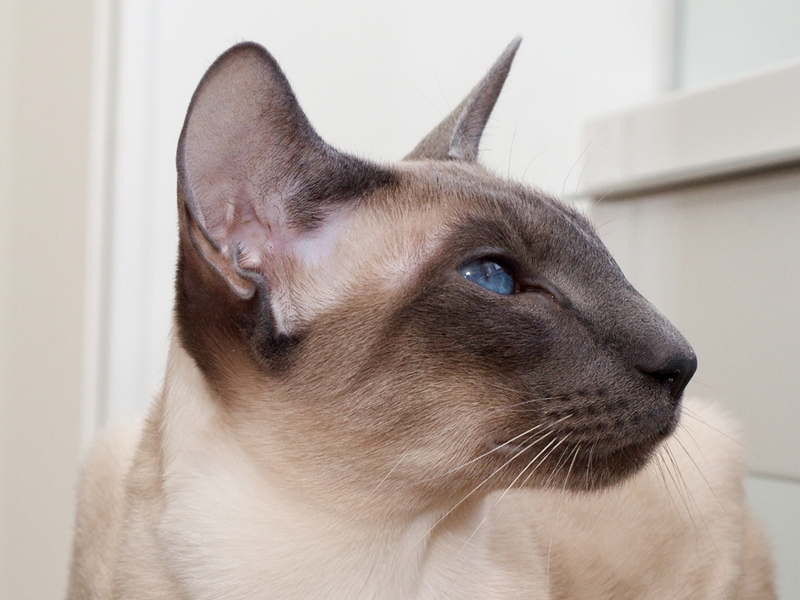 So I started looking for a Siamese/Oriental that is light in color. 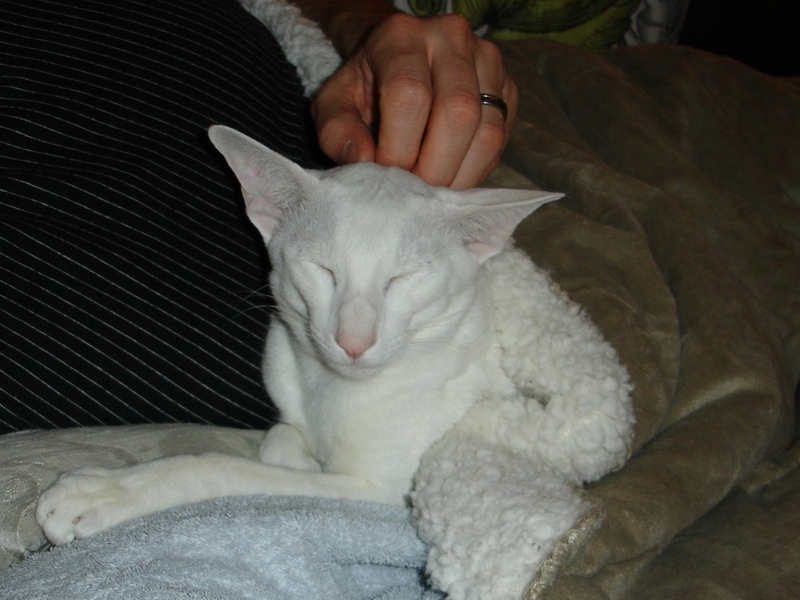 After some time I found a cat I liked on pictures, and whose pedigree was an excellent match for Jossan‘s; the white prince, IC Edo Créma de Luxe, M, SIA w 67. His pet name is Goofy. Here is the picture I got from his owner, Sofie. The picture does not do him justice, Goofy is more handsome in person. His tail seems short on the picture, but it is a bad angle, it is actually quite long. 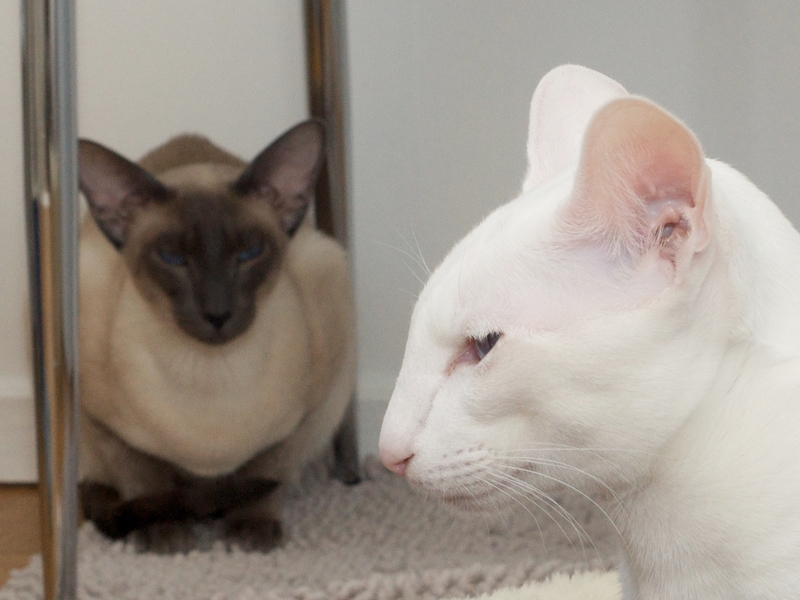 Goofy has the most amazing set of deep blue eyes, tight and silky fur, white as snow. A white beauty! Those beauties are hard to find, there is not so many of white Siamese (or – Foreign Whites) in Sweden, or anywhere, really. Goofy is not extreme in type, but he has all the good parameters. He is a very alert young male cat with strong muscles and magical appearance. Also, he seemed social and not afraid or shy. I talked with his owner, Sofie, a few times on the phone before we met and it felt right from the start. They live in Sala, about 110km from Stockholm and we went there with Jossan last weekend, when she was about 2-3 days into her new heat cycle. And, you know what – my little racist loved the white charmer! She was cuddled next to him in the same cat-bed after less than two days she had spent there! We do not know whether they successfully mated, but we hope they did, the right sounds are reported to had come from their room. In two-three weeks we will know! Joakim took Jossan’s picture, and the one of Goofy I got from Sofie. Jossan is back at home now, and she is still a bit in heat, but that is not uncommon. Whether or not a female cat mates, her estrus cycle will last about seven days, and sometimes longer. The thing is that cats also have their preferences and taste, and we pick their partners according to their pedigree, show results, or whichever other parameters we find important, but our little darlings simply may not like our choice. We do not know best. In nature they would have more freedom to choose. Jossan is one strong-willed cat, with a lot of integrity. And this time it seems we managed to find the cat she liked and accepted as a potential father for her kittens. So exciting! Some time ago we decided that it was time for our Jossan to become a mom. We searched a lot in order to find a suitable candidate for her first date, and it was not easy.